Developed and manufactured by the Goodyear Rubber Company. Much like manmade Micarta, neoprene is resistant to corrosion, acids, oil, solvents, heat and cold, moisture and heavy impact. It non-slip surface makes it ideal for working knives that are used when wet. 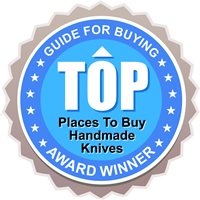 Fish fillets, Kitchen cutlery, and of course, hunting and skinning knives, to mention just a few.